The Official Heavenwood’s FB Page! Heavenwood was originally formed as a death metal band under the moniker Disgorged in 1992. In 1995 tragedy struck the band as their current bass player committed suicide. They signed a record deal with the German label Massacre Records and their name changed to Heavenwood and released two albums. “Diva” was promoted with two European tours, the first in the end of 1996 with Atrocity and In Flames and the second one in the spring of 1997 together with Theatre Of Tragedy and Lake Of Tears. They also played with bands such as Cradle Of Filth and Moonspell between others in their home country. In 1997 “Diva” was released in the Japanese market through Marquee Belle Epoque Records with some extras. Their second album “Swallow” released in 1998 features guest appearances from Theatre Of Tragedy’s female vocalist Liv Kristine and Gamma Ray’s mastermind Kai Hansen. 1998 was the year for the first Portugese Metal act on the famous Wacken Open Air Festival playing for a full Wet Stage with fans from all over the world followed by more European Tours with bands such as Atrocity, Solitude Aeturnus, Saviour Machine and more. 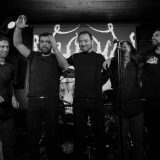 Heavenwood would be considered Band sensation in many important Metal Magazines such as Metal Hammer, Rock Hard and a 4 in 5 in Terrorizer Magazine was ” a gift ” for the Portuguese newcomers effort in the music scene. Heavenwood were frozen from 2001 to 2003 due to some internal problems. After several line-up changes Bruno Silva turned into the second Guitar-player. 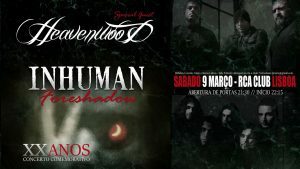 October 2003 was the Official Return Show for Heavenwood on the most important Live Rock Club in Portugal with a fullhouse night where almost 1000 people received the band with open harms followed by many gigs in Portugal and Spain. 2008 “Redemption”, was released in the band’s home country of Portugal at the end of August. The special-edition version of the CD (limited to 1,000 copies), which included a free ticket for one of the group’s two record-release shows, sold out almost immediately. Shortly afterwards, a second special edition for the Portuguese market was released, including a totally different artwork and booklet. “Redemption” was mixed at Fascination Street Studios in Örebro, Sweden with Jens Bogren (Opeth, Soilwork, Amon Amarth). The initial recording sessions for the CD took place at Ultrasound Studios with Daniel Cardoso production and Pedro Mendes assistance. The CD features guest appearances by Annihilator guitarist Jeff Waters (in the song “Bridge To Neverland”), Firewind guitarist Gus G. (in the track “One Step to Devotion”) and singer Tijs Vanneste of the Belgian progressive metallers Oceans Of Sadness (in the song “Obsolete”). HEAVENWOOD released its fourth album, entitled “Abyss Masterpiece”, on March 14th, 2011 via french Listenable Records. 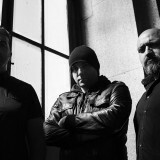 The CD was mixed and mastered by the german producer Kristian “Kohle”Kohlmannslehner (CREMATORY, POWERWOLF, BENIGHTED) at Kohlekeller Studios in Germany. “Abyss Masterpiece ” was firstly recorded again at USStudios with Daniel Cardoso. The album artwork was created by Matthew Vickerstaff of Darkwave Art, who has previously worked with CRADLE OF FILTH, MY DYING BRIDE, among others). “Abyss Masterpiece”features guest appearances by RAM-ZET’s Miriam Renvag (also known as SfinX) on a track called “Leonor”, alongside Russian symphonic classical composer Dominic G. Joutsen. “Abyss Masterpiece ” is an intense album, both musical and lyrically. It has great orchestral arrangements by Dominic G. Joutsen that when added to the guitar riffs and melodies made everything become unique, heavier and dark. 2015 ” The Tarot of the Bohemians ” is the fifth album to be released firstly in Portugal, with a limited edition by Raising Legends Records. The album will have the international released and distribution afterwards by a new international label ( t.b.a ). Inspired and dedicated to the french occultist Papus and his studies regarding the Tarot. Heavenwood drum sessions for the fifth studio album “The Tarot Of The Bohemians ” were done by Daniel Cardoso ( Anathema ), who previously recorded ” Redemption ” and ” Abyss Masterpiece “. The drum recording session took place at Ultrasoundstudios in Braga. French drummer Franky Costanza, from the band DAGOBA, is a special guest for this new album. Franky Costanza recorded the songs ” The Wheel of Fortune ” and ” The Lovers “. Filipe Marta for ΔvantegΔrde MNGT & Artists Relations!